Photos c/o Jai Carol & Co.
Cookie Johnson and Pat Smith have much in common: they are both married to high-profile athletes (Earvin "Magic" Johnson and Emmitt Smith respectively), they are both deeply connected to their Christianity, they are both Mothers who dote on their children and as of this year... they are both book authors. 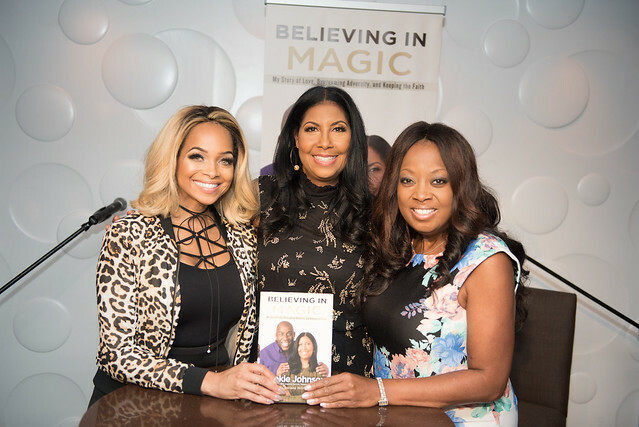 Cookie and Magic hosted a book party in Los Angeles for Pat earlier this year when she was on tour for her debut tome Second Chances, so when Cookie's book Believing in Magic was recently released Pat couldn't wait to return the favor. In her new memoir, Cookie shares details of her marriage, motherhood, faith, and how an HIV diagnosis twenty-five years ago changed the course of their lives forever. On November 7, 1991, basketball icon Earvin “Magic” Johnson stunned the world with the news that he was HIV-positive. For the millions who watched, his announcement became a pivotal moment not only for the nation, but his family and wife. Twenty-five years later, Cookie Johnson shares her story and the emotional journey that started on that day—from life as a pregnant and joyous newlywed to one filled with the fear that her husband would die, she and her baby would be infected with the virus, and their family would be shunned. Believing in Magic is the story of her marriage to Earvin nearly four decades of loving each other, losing their way, and eventually finding a path they never imagined. November 7, 2016 will mark a quarter-century since the announcement and Cookie is now finally ready to share her full account of the reasons that she stayed and her life with Earvin “Magic” Johnson. Cookie Johnson was warmly welcomed at a private party last week hosted by Pat & Emmitt Smith at The Tipsy Alchemist (the old Bubble Bar) on Cedar Springs. VIP guests included Donna Joyner Richardson, Jane McGarry, LeeAnne Locken, Anita Hawkins, Scott and Carole Murray, Dee Lincoln, Amy Vanderoef and Cheryl Jackson. The ladies were coming off of a love fest having recently spent 10 days together yachting around the French Riveria celebrating Cookie and Magic's 25th wedding anniversary (click here for more on that fabulous trip). Pat presented Cookie with a pair of lululemon yoga pants in a fun olive and green pattern "to match her book cover" because "I learned on our recent trip together that Cookie is obsessed with lululemon and it's important to be comfortable and zen when you're on tour." Another guest from that fantasy trip was Star Jones who flew in to lead a Q&A with Cookie about the book. "I wasn't about to miss this and let Pat have all the fun without me," Star exclaimed. I was charmed by Jones but even more enchanted by her little Maltese, Pinkie, who sat quietly on a settee in the corner of the room and lovingly licked the hand of anyone who sat next to her and gave her a pat on the head. She was adorable!! Believing in Magic is currently available at Amazon and in book stores everywhere.